FARMAN MACHINERY INDUSTRIAL CO., LTD.
FC-250EX (Full enclosure) is a 3 axes automatic grinding wheel. This machine model is specialized design for closed and air-conditioned factory. “Full enclosure” can prevent dust and cutting fluid from being exposed to air. To practice a clean and safe working environment. 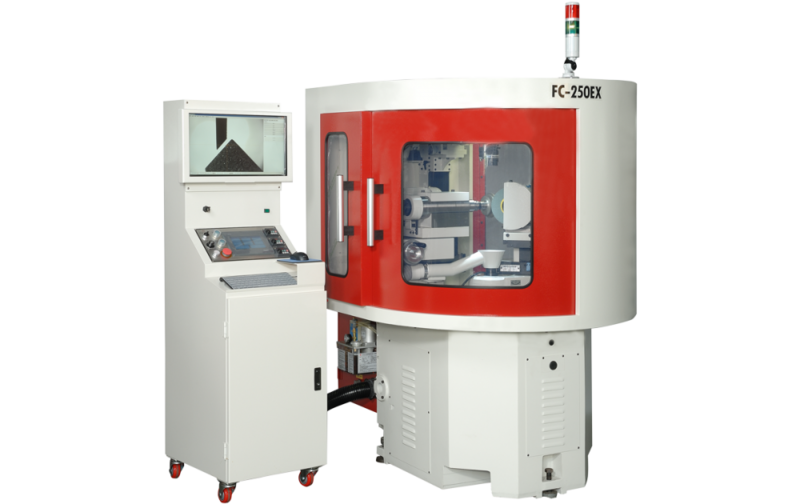 FC-250EX (Full enclosure) is finisher and drawn with the machine's special CCD application Auto cad to DXF loading can be processed easily render the size and contour, double R angle, round groove knife, sharp corners small R-shaped Jieke to be varied in accordance with the demand of processing. Machine operation with PLC Human-Machine-Interface + hand wheel control, feed, rotation, swing can be set automatically to grinding, Also can use hand wheel mode to do small value and light grinding. © 2017 FARMAN MACHINERY INDUSTRIAL CO., LTD. ALL RIGHTS RESERVED.